Looking for a new device for your space-age, connected bachelor pad? Philips today announced the launch of Hue Go, an addition to its Hue range of smartphone-controlled bulb and lighting products. 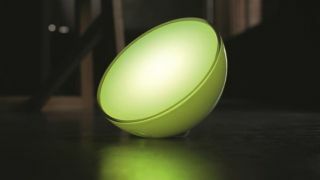 To quote the breathless press blurb, "Philips Hue Go is an iF DESIGN AWARD-winning, fully portable wireless lamp… meaning that it is now possible to experience the light that you want, wherever you want as you move around your house and garden… This newest addition to the extensive Philips Hue system delivers total freedom with light." So in other words: a battery-powered light. Look how much these ladies are digging it. Philips Hue Go can last for up to three hours on battery alone, and is humidity-resistant enough to take from your lounge to your kitchen, but it won't survive an assault by wind and rain, so for God's sake get it back inside, or at least under cover, if the weather turns. The Hue range now has over 200 third-party apps to do everything from waking you with an artificial sunrise, to turning your hallway into a disco, with a lightshow that pulsates in time with your music, and Hue Go taps into that. This also means you can receive messaging notifications through a subtle colour-change of the lights, and link the Hue Go with other Hue products, while having dinner with your friends Hugh and Hugo. Smartphone control of something as fundamental as lighting isn't everyone's bag, so Philips has also included a control button on the product itself. This cycles the light through seven light settings ranging from warm white light to a bluer simulated-daylight type light, to five effects: "Cozy Candle, Sunday Coffee, Meditation, Enchanted Forest and Night Adventure, to enrich, "a romantic dinner, a relaxing bath or a Zen moment." Mmm-mm. The cost of this next-level, wholly-portable-for-three-hours-at-a-time lighting experience? £80/$100/AUS$160. The Philips Hue Go joins the other Hue products which include the white-light-only Hue Lux and Hue Phoenix and the Friends of Hue line of light fittings.